The Portland chapter, or pod, of Studio Art Quilt Associates (to which I belong) is well attended and very active. Back in November or so, the group arranged to meet at the Portland Art Museum for a docent led tour of the Seeing Nature exhibit. It was great to get out of the routine of meeting in community center rooms and surround ourselves with inspirational art. It was even better to hear insight and connections from our well practiced docent. I highly recommend that groups similar to ours look to their local museum(s) and schedule a group tour once in a while. It’s inspiring and a fun change from the usual. I look forward to the next time Portland SAQA does this again. I loved the way people’s outfits were matching the varied artworks! A small painting by Klimt was reproduced writ large on a stairwell window. I think it looks even better than the original. Terry, Gerrie, Suzie and I took a little extra time to check out the Paradise, Fallen Fruit exhibit. It looked chaotic and “too much” at first, but once we realized that each wall had a unifying theme, then we started to draw connections between the individual works and the chaos became a conversation. It was very different, and quite interesting. This wall reminded me of the work of Kehinde Wiley. Mostly, I think it’s the pattern and color. Yesterday I posted about all the places we went on Natalya, Robin, Vivien and my art posse day in NY. This is a deeper look into a few of our stops. Multiple Exposures. I wasn’t sure what to expect in this exhibit of photography and jewelry, but it was surprisingly inspirational, not to mention beautiful. No photos were allowed, but they did have a selfie booth with which we had way too much fun. 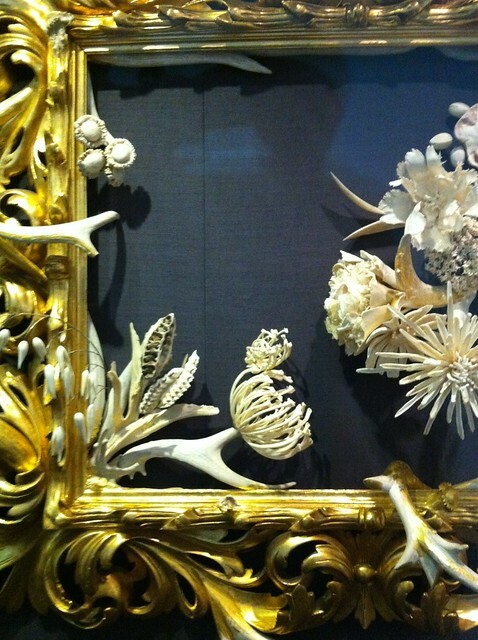 In addition to contemporary jewelry and body adornment which incorporated photography in a wide variety of ways, there were also historic pieces which I found intriguing and inspiring. There was a grouping of photographs of a single eye, supposedly that of an absent loved one, which I could see informing some of my work, as well as Trench Jewelry made from found bits of armory and other metals. Some things were weird and wonderful, some beautiful, some gross, and some surprising. Overall, it was quite inspiring. RE:Collection. I took photos for my own note-taking purposes, so they are pretty poor, but just for a taste of the exhibit, I’ll share them. This exhibit was subdivided by theme. 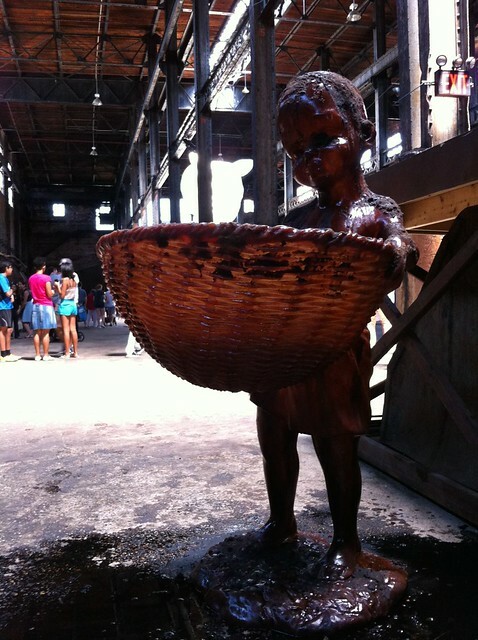 I was very attracted to the collection of political and socially minded works. That’s similar to what I’m exploring in my own work so it’s no surprise. This is “21 Countries” by Stephen Dixon. 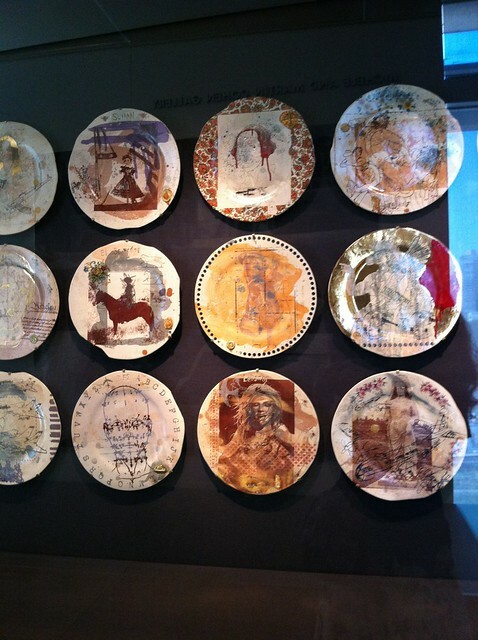 Each plate represents a country where the US has had military intervention. I didn’t completely understand why plates, or much of the imagery, but I really liked the layering of images, color, and line. Robin, I think, mentioned that layering might be the trademark of our era. Thinking of sampling in music, I think she could be right. 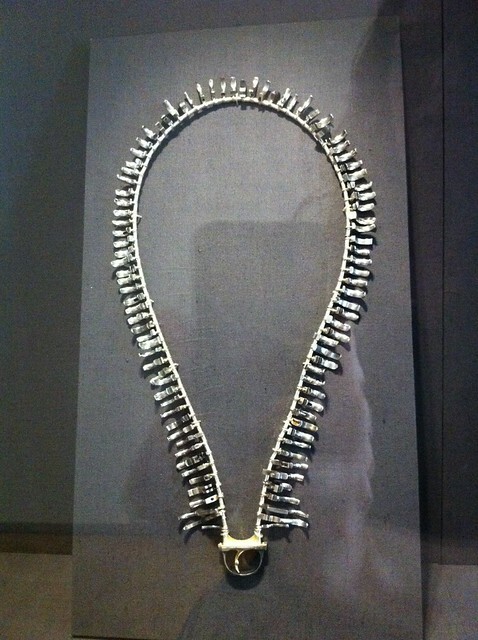 I don’t remember the title of this necklace by Boris Bally, but it might be “Brave.” Given what I’ve been working on recently, it struck a chord. 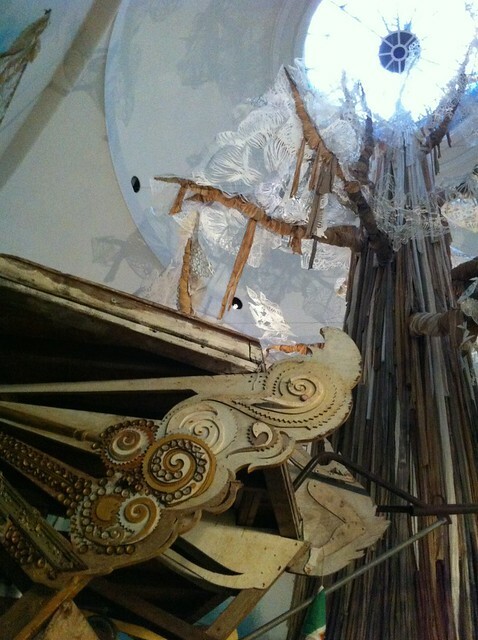 A detail from a work by Jennifer Trask. I REALLY like the way she makes creepy beautiful. So many inspiring things to see. We just soaked it all up! 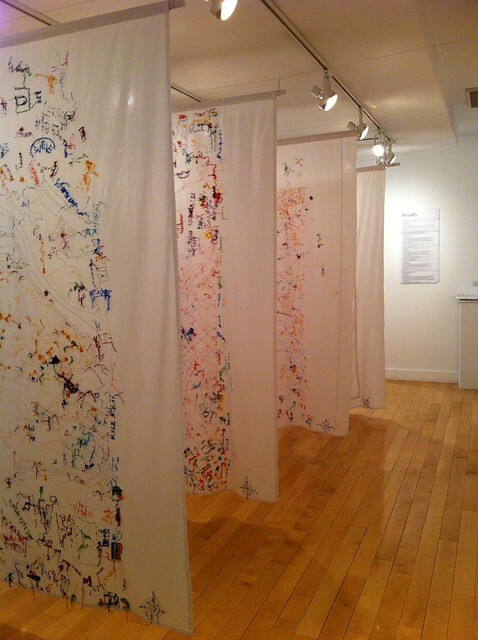 The Hudson Guild had another exhibit we enjoyed. Urban Fabric’s creator Lix Kueneke embroidered city maps on fabric and then invited the city’s inhabitants to stitch on the maps in response to several questions, such as “what is the heart of the city?” and “what is a negative place in the city.” It was interesting to see that in some cities, the loves, hates, and interesting bits were scattered overall, and in other cities, they were clustered in specific spots. 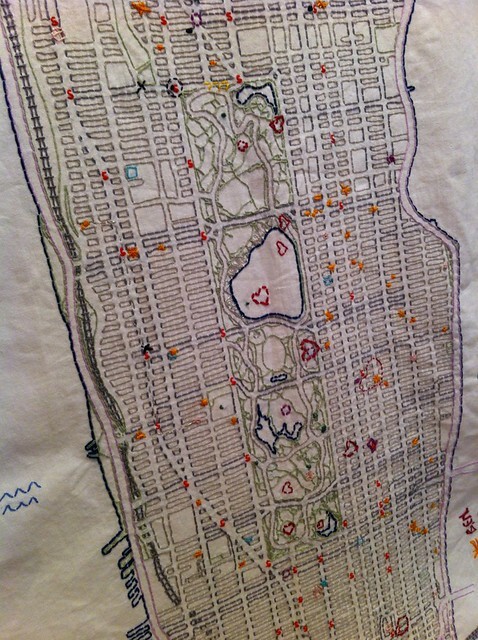 The maps are beautiful in an of themselves, but the viewers’ responses on them add a wonderful depth. Even the backs of the embroideries are intriguing. 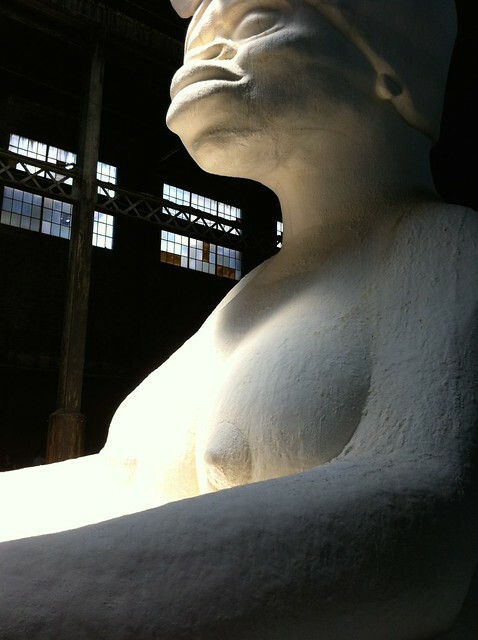 On Sunday, Natalya took me to see Kara Walker’s “A Subtlety” at the Domino Sugar Factory. It is worth reading up on this because of all the layers of meaning she has imbued it with. I can’t remember where I first heard about it, but I was excited when Natalya posted her visit on Instagram and then suggested we could return to see it on my NY weekend. I have admired Walker’s paper cut imagery for years, so this was particularly interesting to me. Artsy has a nice page with a range of Walker’s work too. 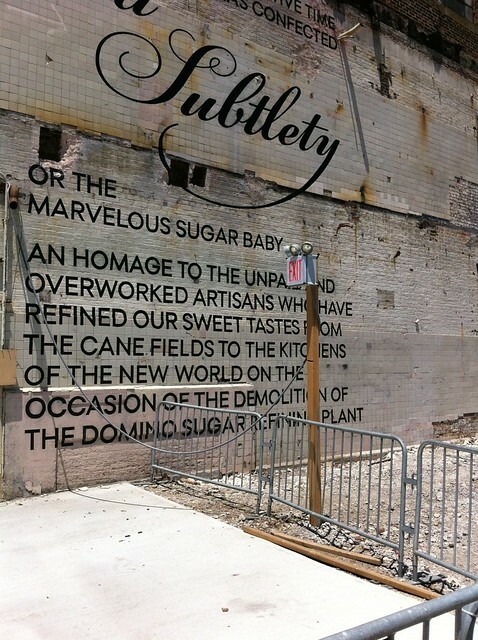 The sugar factory is about to be demolished, and as a send off Walker had the opportunity to create a very site specific work. The centerpiece is an enormous, and I mean enormous, Sugar sphinx. She is powerful from the front and subjugated from the back, and completely dominates one end of the building. 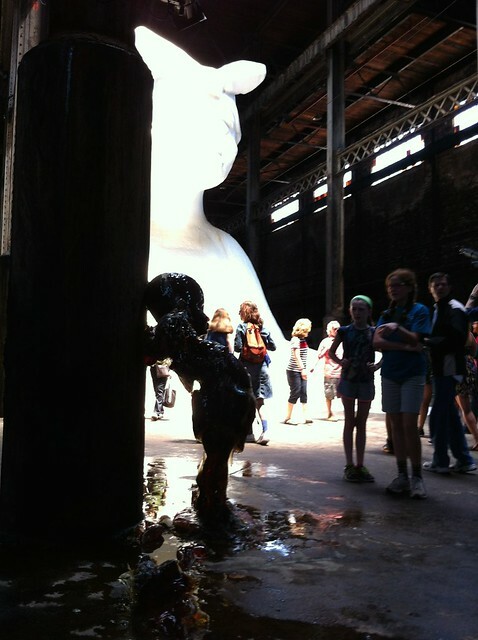 She is attended by life-sized molasses boys that glow when the light catches them just right. All around is a disintegrating, syrupy, sweet mess. It’s makes quite an impact. I would love to see cities and private entities take an interest in engendering more provocative, public, and site specific art like this. It is a gift to the community and anyone fortunate enough to visit. 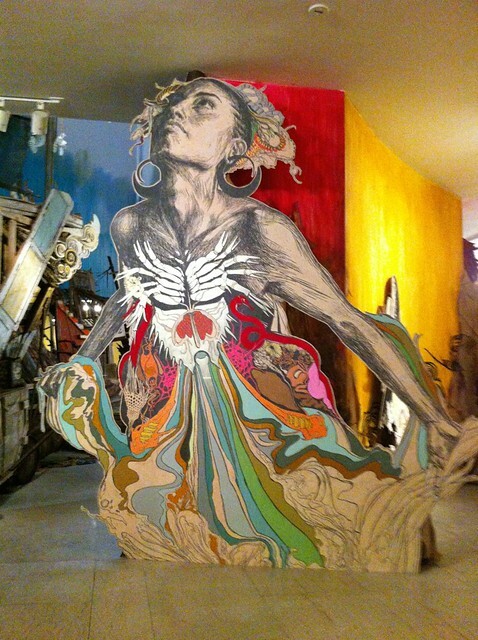 I had never heard of street artist Swoon before about a week ago, but heard an interview on public radio about her junk rafts being installed in an exhibit. The interview intrigued me, but I didn’t really take note of when or where the exhibit was. 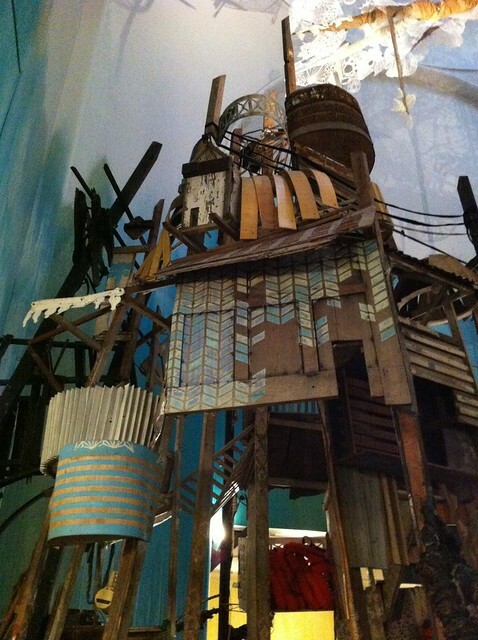 Natalya had heard about it as well and, knowing it was at the Brooklyn Museum, suggested we go look. Oh wow, was it breathtaking! 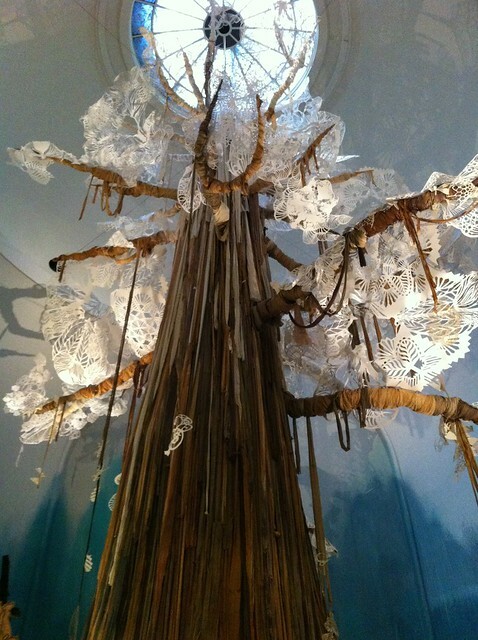 Another site specific work, the installation centers around a huge fabric tree that extends all the way up to the rotunda and blooms with lacy paper cutouts that cast delicate shadows on the walls. 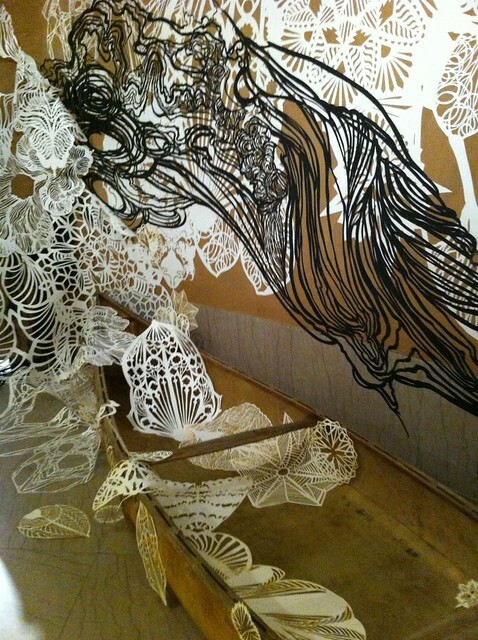 The cutouts extend all the way to the floor and extend out as graphic water swirling around the boats. The rafts themselves are made of junk and found materials. 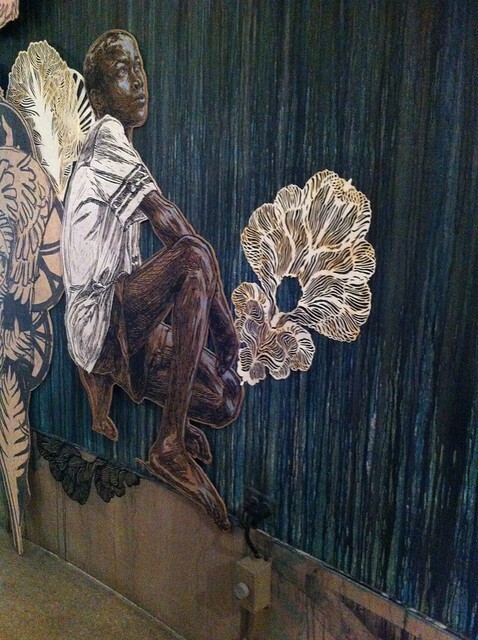 They are fantastic vessels which, like all of Swoon’s work, are a deft combination of rough and refined. And the best part? She can draw! The combination of loose and tight, rough and refined, decay and growth, and plain old fine craftsmanship left me standing in awe. I studied each larger than life woodblock portrait hoping to soak up some of Swoon’s skill by osmosis. Amazing, amazing, amazing. An inspiration-filled weekend like this begs for follow-through. We talked a lot about what we were seeing, what spoke to each of us and why, what our own goals and hopes are, how the exhibits might inform our work, where to go next, how to emulate those we admire, and on and on. More on my thoughts tomorrow. Every now and then you run across a blog, a Flickr page, or Etsy shop that grabs you a little bit. When you run across it again, you say “yeah, I like that!” And by the third stumble, if you haven’t already, you bookmark it. I’ve been lurking at Melissa Stanley’s blog for a few months now, in love with her crocheted creatures, and her little houses with legs! What goes better with roots than legs? Then Melissa went and added this little free range studio monster to the shop and put me over the edge. He’s so cute I had to have him. He’s not in my studio though. Hubby and son thought he belonged in the living room — where he’s terrorizing the Baba Yaga House I also purchased, and two mod birds who happen to have legs too. Lookie what I got in the mail yesterday!! 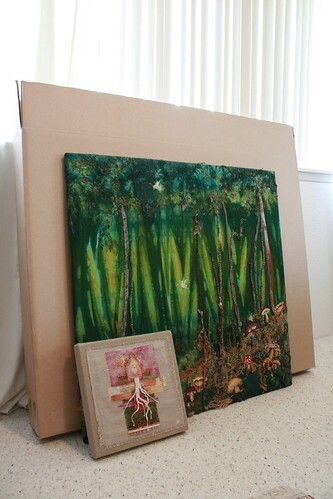 Several years ago Gerrie and I decided to swap art: I made her a creche set and she’d make me indigo aspens. Every time Gerrie would post anything with aspens I’d wonder if they’d be mine. My heart skipped a beat when she showed this one — I knew this was IT! As soon as I opened the box, I looked around for a wall to put it on. Although most of my blue art is in the bedroom, the orange on this really wanted to be in the living room. I took down one of my pieces and held the aspens up… and then I realized that just below it were my pair of custom mod birds made by Gerrie’s talented daughter, Lisa! Ah, perfect. The blog has been a little slow lately. I blame summer. It’s hard to focus with the kids around. It’s also hard to do much while playing tourist –which is soooooo easy to do here in Hawai’i! We put my MIL on a plane yesterday though, so it’s back to our regular life now. I’ve been overwhelmed by it all. I was telling myself that I just wasn’t in the mood, or I was too busy with fun excursions, but I now think overwhelmed was playing a big part too. “Pick a goal” is the obvious answer, but they are all so enticing. What to do? I spoke with blog friend Kathy Mack this morning (I am so impressed with what she’s created with her shop and value her opinion) and she reminded me to chose one little thing to do each day towards my goal(s). So that’s what I am going to do. Yesterday I worked on my 12×12 Passion piece, and the day before I sent out an entry for an art quilt show. I would have sent this house quilt out too, but I ran out of checks for the entry fees and our mail has been sketchy since we returned from our cruise. By the way, the house quilt is going to “Breaking Traditions” which is a benefit show and this year’s theme is Home, so how could I not enter?! Today, I think, will be more 12×12 and hopefully some writing. Tomorrow I’ll quilt. And, so as not to become overwhelmed, I am going to do it all on my terms. I will not worry about all the potential roadblocks, or how and what everyone else is doing. I will do what I can — and whatever happens, happens. First, I’m off to make some coffee.